Many researchers accept tree structures as common signs of Sasquatch habitation, and assume they are markers of territory or acts of aggression, but it that really the case? It has been suggested by some Native American Elders and First Nation Tribes of Canada that Tree Structures mark and commemorate the birth of a new member of a Sasquatch Family or a Marker of a colony. While many tree structures could be the course of nature, in some cases, deep in the forest, (we're talking miles in off main trails and paths), tree Structures are sighted and can are very odd in relation to the natural environment. 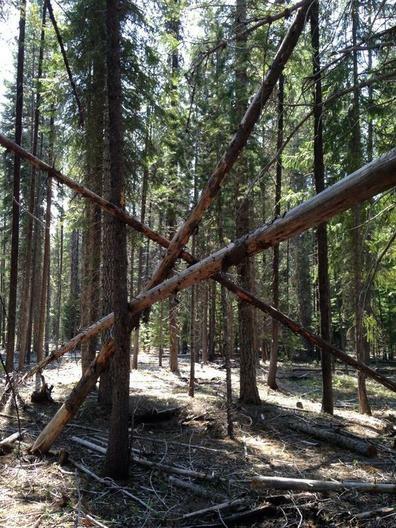 While recently in the Sasquatch Provincial Park in British Columbia it was noted that Tree Structures were found in similar configurations almost triangulating a territory. Could this me a marker's for juvenile's to know the boundary of their habitat? While these types of structures could be left over from a storm coincidentally or even an old structure designed for a tarp or primitive hut, potentially left behind from a tribe or hunters, the size and sheer amount of effort for such a large structure doesn't make sense. As if this was the work of a survivalist and or primitive shelter there are many "easier" ways to construct this type of dwelling. While this can be a natural occurrence in nature, many consider it overwhelmingly likely that a Sasquatch built that structure, especially considering the rock throwing, wood knocks, eye shine, tree break, and possible sighting that first nation people experienced in the same area. First Nation Tribes and Native American tribes have many stories of this type of marker and while it doesn't prove the existence of Sasquatch it does offer some interesting discussion. ​Tree Breaks do occur in nature by rot, disease, wind, weather, clumsy large wildlife and humans. However many times researchers run into a line of tree breaks (hundreds of yards long), high off the ground, and the branches seem to be twisted. While this wouldn't be uncommon if a large vehicle or storm passed through the forest, when you add in the fact that many of these trees are twisted which could only be done by a species with opposable thumbs it creates a puzzling picture. Could a Sasquatch be breaking tree's 8ft off the ground to bring vegetation down for consumption? or could this be a territorial line of demarcation for other colonies or humans. As indicated on the videos below, large species even Gorilla's do break tree's to get food sources. While Sasquatch has been suggested to break trees as a show of force, mating ritual and or territorial display, it would not be uncommon if this was done for resources. Another theory is to suggest Sasquatch uses them to aid them in walking as sort of a crutch and to make it easier to move throughout the forest, or even a directional path marker to guide their way in future navigation. ​In either case - the theories continue to abound.